Warning: Long, ridiculous picture filled report ahead. I know Dragon*Con was a whole week ago, but it seriously took me right up until today for me to start feeling like I have things under control—and by under control, I mean I’ll finish my lecture slides hours before class today instead of minutes. 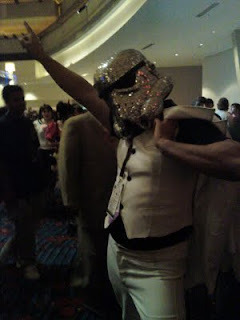 For those of you who have never been to a Fan Con (not to be confused with a writing conference, though there’s often plenty of advice on that front as well), imagine all the nerdy people you know, then make it cool to be nerdy. People—grown adults to children—go dressed as their favorite characters, so at any moment you might run into a Vulcan chatting it up with Batman done in medieval armor. If you ever go to one of these, be careful who you dress up as (more on that in just a minute). It’s a pretty unique event when you can bump into comic book heroes (I even saw someone dressed as Kilowag walking around calling people “poozers”), anime characters, be served drinks by R2D2, watch storm troopers face off against cylons. Seriously, more people were in costume than were not. Every major nerdom—err, fandom, was represented. Firefly, Star Wars, Battlestar Galactica, Harry Potter, Anne McCaffrey, Tolkien, Buffy the Vampire Slayer, Indiana Jones, Utena, Halo, Resident evil, SAILOR MOON (I ran into three different sailor scout parties! ), I could literally just keep listing here and not be done for a long time. This could take forever, but I’ll just drop by the best points. 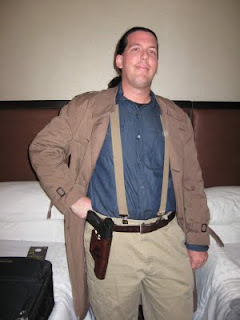 So the first night my group of friends went as Big Damn Heroes (Brown Coats from Firefly). The costume was fun, but the best part were the guns ( I know, violence in entertainment), but not for the reason you think. We’d spent a lot of time spray painting our guns to look a little more steam punk, and one of the people in our party is a leather carver. She made everyone these amazing holsters. The effect: beautiful, futuristic guns in hand crafted leather holsters, worn in the open. That night we ate at an INCREDIBLE restaurant, and our waiter told us that he was warned just after we were seated by the seating hostess “You have guests, and I think they might be packing.” We showed the waiter our guns (painted squirt guns and nerf dart guns, seriously) and had a good laugh all around. The next morning we had breakfast with Felicia Day (Dr. Horrible, the Guild, Eureka). Okay, well, maybe not quite breakfast with Felica, but she did eat at the table next to ours which was pretty entertaining. Oh, and here’s the side point that I have to make. For those of you who are tall, meeting actors is always a little disappointing. I’m 5’9” and I hate meeting people who’ve been portrayed as really tall, because THEY NEVER ARE. Seriously, Keanu 5’8”, Tom Cruise 5’2”, Robert Downey Jr. 5’8”, that means I’m taller than a lot of these guys playing super heroes. I’ve learned to accept it, because in Hollywood it isn’t who you are, but what you’re standing next to that counts (they actually do have sets built for shorter people). I went as Dr. Horrible, which was a ton of fun because Captain Hammer (the nemesis) is also a popular choice for Cosplay leading to impromptu reenactments in the halls (Yeah, this sounds nerdier with every word I type). That night there was an elf party, but I didn’t have time to change, so I went as Dr. Horrible (I guess I was looking to expand my territory). So, somewhere floating around on the net is a picture of Dr. Horrible dancing with a bunch of elves. Yeah, nerdier by the second now. I'm holding my wand like a foil. 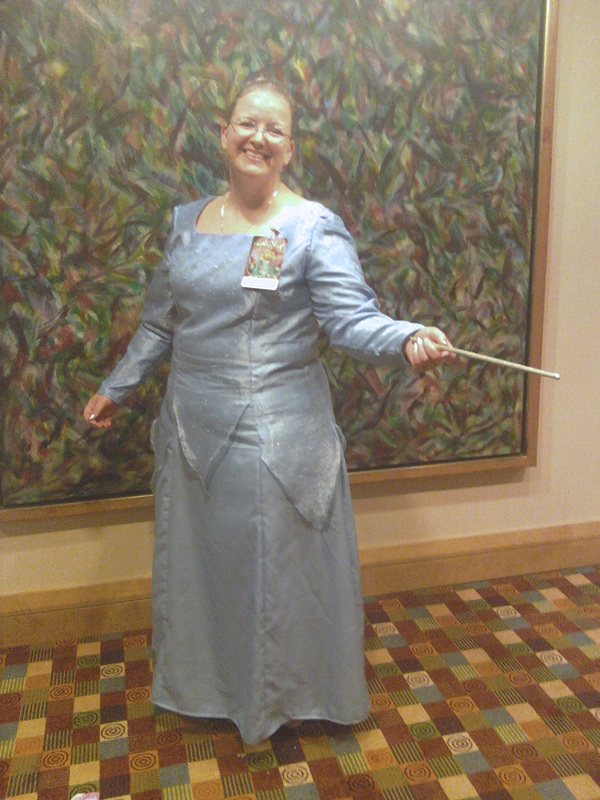 The second day of the con I went as the faerie godmother from Shrek. Now, here’s where I have to put in my warning about picking who you go as for Cosplay. See, when people see a faerie godmother, they just want you to grant a wish, so for the most part people are like “Oh, Faerie Godmother, I have a wish,” but then being from Shrek my response is “Oh sweet pea. Happiness is just a tear drop away.” Until I’ve spoken they just think I’m some sweet old lady dressed up as a faerie godmother. Once I’ve spoken they all shrank back in terror. Villains are not supposed to have sparkly makeup. One woman even responded with “Oh, you’re from Shrek,” like I was gum stuck to the bottom of her shoe. While entertaining, as far as getting a solid gut reaction from people, it wasn’t the reaction I had expected. I think next time I’ll make sure my wand is a little more accurate. yup, there she is, a real live published author with a fandom. On the third day I didn’t dress up as anyone. 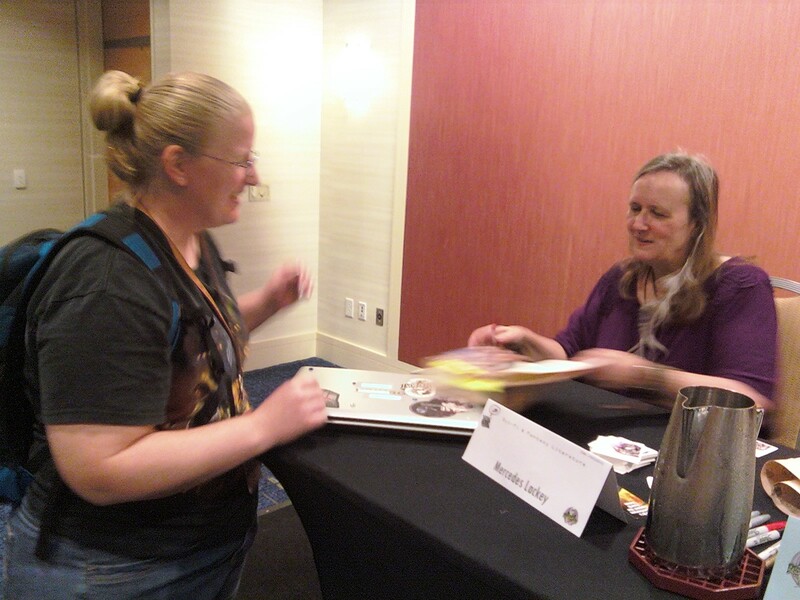 Instead, I went to a book signing by Mercedes Lackey (love those books). I figured there wouldn’t be too much trouble getting in to see her, but I thought I should know exactly where the signing was just to be safe. I was wandering around at 8 for a signing at 10. I saw a line near the room I was looking for, and there were already 25 people waiting. I asked, and to my horror, it was the line for Lackey. I made the wild eep noise, because I didn’t have anything for her to sign. I got in line, and consoled myself with just touching greatness (I really love her books). But, by lucky happenstance I happened to have my computer with me (I was planning to work on my dissertation from a nice crowd watching place, but that never panned out), and so I had Mercedes Lackey and Larry Dixon sign my computer for dissertation defense luck. They thought it was pretty funny, and Larry even drew a little sketch on my computer. Absolutely made the con for me, right there. That night we went to the Yule Ball, where I wore my McConagull as a Green Lantern prototype, and it went over really well. Everyone loved it. And the Yule ball was hilarious. Voldemort crashed with a huge group of death eaters, and the whole thing was like a high school dance without all the awkward parts. It may have been the best dance I’ve ever been to. I had more fun than at my prom. 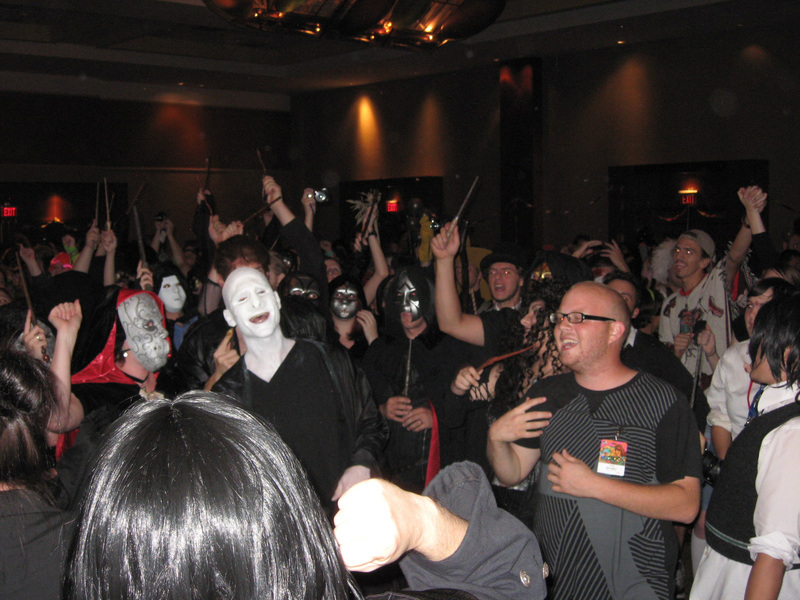 Yule ball included such moments as Mad Eye Moody air guitaring, wands held high to Livin’ on a Prayer, and other tomfoolery. It was just too much fun. The last day of the con was exciting for totally different reasons. The last day of any conference is always more subdued. There’s saying good bye to people, buying the last minute stuff from the vendor’s tables, and trying to get to the airport. Oh, and then there’s tornadoes from Tropical Storm Lee. Yikes. So our flights were all delayed and many of my friends got to spend too much time in airports trying to get home, but yes, awesome con. I still smile when I see those silly signatures on my computer. This sounds so FUN!! Especially the Yule Ball. It was a ridiculous amount of fun. The whole time I kept looking around thinking I was going to be in trouble because it just seemed like too much fun.